This building is a historic building in the center of Bandung. Called as Gedung Sate because this building has a unique characteristic, namely 6 skewers ornaments that exist on top of the central tower. These 6 skewers symbolize the 6 million Guilders used to build this white building in its time. This building is very famous not only in the city of Bandung, but also well known in West Java and Indonesia. The building that was built in 1920 is still standing strong and functioning as the center of Bandung city government. The building is touted as the 'White House of Bandung' has now become one of the tourist attractions in Bandung the most widely used photo-taking place. This is because the architecture is very beautiful and majestic and the elements of history and culture it has. Not only the building is very liked, but also the complementary elements of the building is a very well maintained park. The park around Gedung Sate is a favorite location for photo-taking tourists, both taking pictures for memento or photos for brides and shooting for movies. Every Sunday, besides crowded with tourism activities, the park area is also crowded by people who want to relax and exercise lightly. Gedung Sate which was in the Dutch East Indies was called Gouvernements Bedrijven (GB), the first stone laying was done by Johanna Catherina Coops, the eldest daughter of Mayor of Bandung, B. Coops and Petronella Roelofsen, representing the Governor General in Batavia, J.P. Graaf van Limburg Stirum on July 27, 1920, was the result of planning a team consisting of Ir.J.Gerber, a famous young architect graduated from the Faculty of Engineering Delft Nederland, Ir. Eh. De Roo and Ir. G. Hendriks and Gemeente van Bandoeng, headed by Kol. Pur. VL. Slors involving 2000 workers, 150 of them engraver, or bongpay woodcutter and Chinese woodcarver from Konghu or Canton, assisted by masons, stirrers and servers from the villagers of Sekeloa, Coblong Dago Village, Kampung Gandok and Kampung Cibarengkok, which they previously worked on Gedong Sirap (Campus ITB) and Gedong Papak (Bandung City Hall). 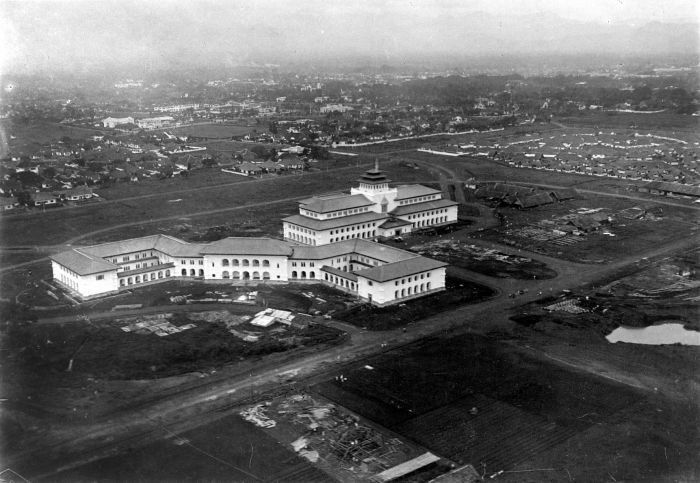 During the 4 year period in September 1924 successfully completed the construction of the main building of Gouverments Bedrijven, including the headquarters of PTT (Post, Telephone and Telegraph) and Library. Architecture Gedung Sate is the work of architects Ir. J.Gerber and his group that can not be separated from the input of Dutch architect Maestro Dr.Hendrik Petrus Berlage, who nuanced face of traditional architecture of the archipelago. Many of the architects and construction experts said Gedung Sate is a stunningly elegant monumental building with a unique architectural style leading to the form of Indo-European architectural style, (Indo Europeeschen architectuur stijl), so it is not impossible if the elegance of Borobudur temple also colored Gedung Sate. Some opinions about the magnificent Gedung Sate include Cor Pashier and Jan Wittenberg two Dutch architects, who said "Sate Building architecture style is a style of experimental results of the architect who leads to the form of Indo-European architectural style". D. Ruhl in his book Bandoeng en haar Hoogvlakte 1952, "Gedung Sate is the most beautiful building in Indonesia". Ir. H.P.Berlage, during a visit to Gedung Sate April 1923, stated, "Gedung Sate is a great architectural masterpiece, which successfully combine eastern and western styles in harmony". As well as the style of Italian architecture during renaiscance, especially in west wing buildings. While the multistory tower in the middle of the building resembles the roof of Meru or pagoda. There are many more opinions of Indonesian architects who stated the grandeur of Gedung Sate such as Slamet Wirasonjaya, and Ir. Harnyoto Kunto. Strong and intact Gedung Sate until now, not apart from the materials and technical construction used. Gedung Sate wall is made of large stone pieces (1 × 1 × 2 m) taken from the hilly area of ​​stone in east Bandung around Arcamanik and Mount Manglayang. Sate Building building construction using conventional way professional with attention to technical standard. Gedung Sate stands on an area of ​​27,990,859 m², building area 10,877,734 m² consists of Basement 3,039,264 m², Floor I 4,062,553 m², first floor terrace 212,976 m², Floor II 3,023,796 m², second floor terrace 212,976 M², 121 m² tower and 205,169 m² tower terrace. Gerber itself combines several streams of architecture into its design. For windows, Gerber takes the Spanish Moorish theme, while for its building is Rennaisance Italia. Especially for towers, Gerber incorporates the Asian stream, the style of a Balinese temple roof or pagoda in Thailand. At the top there is a "skewer" with 6 pieces of satay ornaments (other versions mention jambu air or jasmine), which symbolizes 6 million guilders - the amount of expenses used to build Gedung Sate. Facade (front view) Gedung Sate was very calculated. Following the north-south axis (which is also applied in Pakuan Building, which faces Mount Malabar in the south), the Sate Building is deliberately built facing Mount Tangkuban Perahu in the north. In its journey originally intended for the Department of Traffic and Public Works, even became the center of the Dutch East Indies after Batavia is considered to have not qualified as a center of government because of its development, so used by the Public Works Bureau. 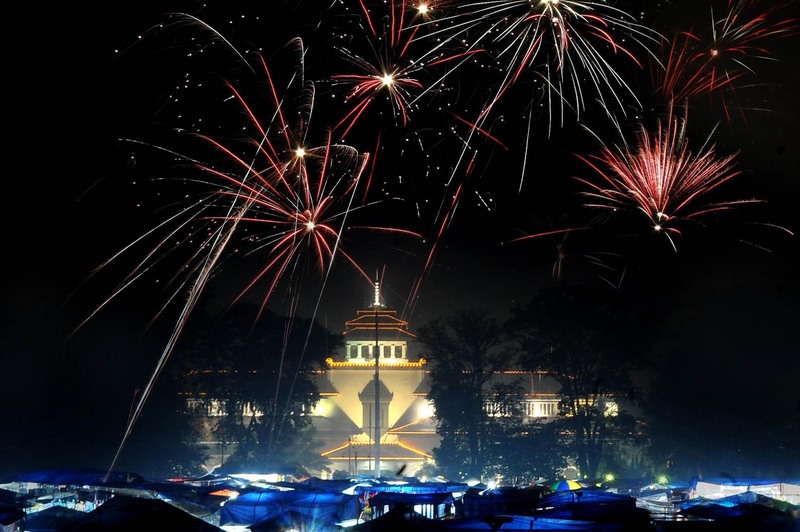 On December 3, 1945, there was an event that killed seven young men who defended Gedung Sate from Gurkha troops. To commemorate the seven young men, made a stone monument placed behind the Gedung Sate page. By order of the Minister of Public Works on December 3, 1970 the monument was moved to the front yard of Gedung Sate. Gedung Sate since 1980 known as the Governor's Office because as a center of West Java Provincial Government activities, previously West Java Province Government occupies Kerta Mukti Building in Jalan Braga Bandung. The Governor's office is on the second floor along with the Vice Governor's office, the Regional Secretary, the Assistants and the Bureau. Currently, the Governor is assisted by three Deputy Governors who handle Government, Economic and Development Affairs, and People's Welfare Sector, a Regional Secretary and Four Assistant Assistant of Ketandangrajaan, Assistant of Development Administration, Social Welfare Assistant and Administrative Assistant. But not all Assistants occupy Satay tower. The Social Welfare Assistant and the Administrative Assistant with the staff occupy the New Building. In the eastern and western sections there are two large spaces that will be reminiscent of the ball room that is often found in the buildings of European society. This room is more commonly known as the west hall and the eastern hall, often used official activities. Around these two halls there are rooms that occupy several Bureaus with their Staff. Top of the floor is called Sate Building Tower, this floor can not be seen from below, to go to the top floor using the elevator or by climbing the wooden staircase.Imperial perfection Gedung Sate is equipped with New Building which takes a little architectural style Gedung Sate but with constektual style of architect Ir.Sudibyo built in 1977 is intended for the leaders and members of the Regional House of Representatives of West Java Province in carrying out its duties and functions as the Regional Legislative Institution. Gedung Sate has become one of the tourist destination in Bandung. Especially foreign tourists many of them are deliberately visited because it has an emotional connection as well as history in this building. This emotional connection and history may feel more complete when climbing the stairs one by one available to the tower Gedung Sate. There are 6 stairs to be passed with each of the 10 steps to be climbed. The beauty of Gedung Sate is equipped with a well-maintained garden around it, no wonder if this park is in demand by the people of Bandung and the tourists both domestic and foreign countries. The beauty of this park is often used as the location of activities that feel kinship, shooting location music video clips either local artist or national artist, the location of family photos or photos of themselves and even photos of the couple. Special day in the Sunday environment Sate House page made a choice where most people to relax , Just sitting around enjoying the fresh air of Bandung or light exercise. Comparing Gedung Sate with central government buildings (capitol building) in many state capitals does not seem excessive. The equation is all built in the middle of a green complex with a magnificent central tower. Especially in terms of location of the sate building and its landscape is relatively similar to the White House in Washington, DC, United States. It can be said Gedung Sate is "White House" his city of Bandung. If you want to get into a building that has been recognized as one of the most beautiful buildings in Indonesia, then you must have permission first. This permission is not hard to get when you follow the procedure correctly. If you only want to be in the neighborhood of the building then you do not need special permission. When you enter the building Gedung Sate, the first time you meet is a set of Sundanese gamelan that is only played on certain occasions, such as entertaining special guests or state events. Almost all parts of this building are offices, including a room that in ancient times was used as an underground dungeon. Gedung Sate Building located at Jalan Diponegoro (Diponegoro Street) Number 22, Bandung. 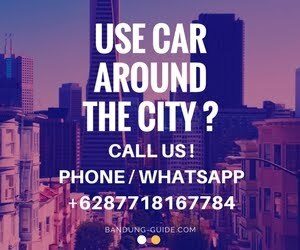 The visitors need not feel confused because in addition to Gedung Sate is located in the center of the City with a name that has been very popular, but also many paths to choose, be it From both air and private vehicles. For those who go through the air path begins from your city that uses aircraft to Bandung. Arriving at the airport then the journey continues to Gedung Sate by taxi or DAMRI Depati Measure transport through Levi Length then down at the town hall. Furthermore if you choose to use a private vehicle then it is better if you stick from Jakarta toll road gatot subroto then surrender then pass through cikampek toll road and then enter toll cipularang (sadang, purwakarta, bandung) and toll padalarang / cileunyi) and exit enter toll pasteur (cimahi / Pasteur / lembang) then go to jl. Dr. Junjunan then fly over pasupati arrived at jl. New Surapati turn right into jl.sentot alybasah then turn right to jl.Diponegoro. Start from this street here you can see the sate building. And if you use public transportation, then take an angkot from the intersection of Jalan Ir. Juanda and Jl. Sulanjana with the direction of Cicaheum then directly down in front of Gedung Sate. Travel time that you travel is also very briefly that is only 5 minutes.